What if I were to tell you that I once took a hot air balloon ride and then landed in a swampy marsh jumping with hundreds of field mice. Sounds like a hot air affair from hell...doesn't it? I've always had a fascination with hot air balloons and, coincidentally, I don't do well with heights. However, I always thought floating gracefully to the horizon would be an awesome and romantic experience. I love their bright colors and fancy varieties. Their enormous size are really quite captivating and especially when you see a cluster of them floating in the sky. So, naturally, when I was given the opportunity to climb on board one of these giant balloons, I didn't hesitate! There was a local hot air balloon rally and air fest that was part of a promo that my employer was sponsoring. Lucky for me, I got a free ride ticket along with a guest ticket. Mister O joined as my guest and we were both pretty excited for this high in the sky adventure. We arrived at the rally and I felt like a kid that had just been dropped into a Willy Wonka movie scene. My eyes popped with excitement when capturing, up close and personal, the massive size and festive colors of each hot air balloon. I clutched onto our golden tickets as we eagerly waited in line and watched while each balloon had to be carefully inflated. The weather conditions had to be perfect and pilots had to give their thumbs up of approval. I didn't want my eagerness putting me on the no fly list, much less, turning into a giant blueberry. So, we waited with our golden tickets like grown-ups. Finally, we got the thumbs up signal and were instructed to our assigned balloon. Handing the pilot the tickets, he assisted me into the wicker basket. Surprisingly, I thought the basket was smaller than I had envisioned and I had to squeeze a little closer to the pilot so Mister O could climb aboard. Just as Mister O was throwing his leg over to hoist himself in, the balloon pilot gave a startled look. "You're coming too?" "Well, of course," I resounded. "Check the golden tickets!" The pilot further remarked that this balloon was only meant for two people. He wasn't sure why we were assigned to this particular one if both of us were going. With my posture about to stiffen into an ungrateful "Violet" episode, I responded “well, now what?" Motioning for Mister O to get in, the pilot said "hop in; we just won't be able to go very far." "With the extra weight on board we'll need to ride lower and take a shorter trip." I was disappointed, but it seemed to be our only option if we didn't want to miss the experience. The three of us crammed shoulder to shoulder awaiting an eventful flight. I prayed with a merciful glance up to The Heavens as the flame ignited the balloon to take flight into the cool breeze of the big blue sky. Somewhat nervous with our situation, we finally reached a comfortable height and we were smooth sailing amongst a dozen other balloons. It was surprisingly peaceful and the gentle cool wind that kissed my face was exhilarating. Floating effortlessly over the treetops and drinking in the astonishing view was mesmerizing. Just what I had imagined! I was absorbed and sucked into my own little fantasy world, when suddenly I heard the pilot say "we're overheating, I'll need to take it down for a landing." "You're kidding, we just got started," Violet I screeched! The pilot explained, "with the extra weight we're carrying, we'll need to land sooner than predicted." I could feel my inner "Violet" temperament beginning to rouse. However, I knew it wasn't his fault. At least, I had been delighted with 20 minutes of balloon floating bliss. His decision was probably a good one, I didn't exactly want my fantasy trip to end whirling and spinning down to terra firma in a deflated balloon! However, the Willy Wonka world I was experiencing did have a brief hiccup and like Violet, I was about to discover that not all fantasies have a happy ending. As we were making our descent, the pilot gently landed onto what we thought was solid ground. Just as the basket hit the thick brush of weeds, we sank through the weeds to a hidden swamp of water and muck below. If this wasn't bad enough, we also disrupted the varmints that lived within! Hundreds of field mice were jumping and surrounding our wicker basket. This was something out of a horror movie! A rodent of any type is definitely on my creep list of worst fears. Additionally, to be surrounded by an army of them with every desire to gnaw on my ankles and draw blood for a juicy cocktail was enough to make my neck hair stand on end! Actually, it straightened EVERY body hair follicle with fear! A mob of mice spring boarding from the dark murky swamp below will forever be engraved in my mind and the vision NEVER to be forgotten! The pilot shocked by our discovery, quickly fired up the torch to have the balloon rise up out of the bog and drift us over to safer ground. At this moment, I wasn’t sure if I wanted to punch him or kiss him! Just be aware, if you ever get the chance to receive your long awaited “Golden Ticket,” there’s always a slight possibility it’ll test your highest expectations. Don’t be greedy! Just enjoy and remember all the good parts! 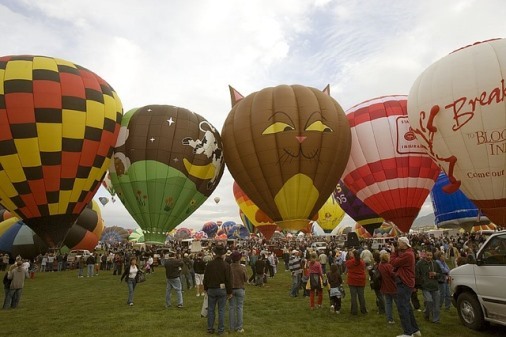 Ultimately, one day I'd like to experience the grand Albuquerque International Balloon Fiesta. Even if it's as a spectator or I happen to scoop a golden ticket, I'll jump at the chance. Let's just hope it's rodent free! Have you received your long awaited golden ticket? Did it meet your expectations? What a great story - love it! Thanks Brenda! Coming from you, that means a lot! I've always wanted a hot air balloon ride. Thanks for taking me along, even if there were a few mice mucking up the works. Now I just need to start looking for my golden ticket. Hope you get the chance to do this! It truly is amazing, except for the jumping mice, of course. Put it on your bucket list or to do list, if you'd rather call it that. Glad you stopped by! So much fun. I would be eeking at all the mice myself. We went to Temecula and my boyfriend went up in the balloons. I stayed on the ground at a blogging conference. They also fly over my brother's house every morning in Napa. They're beautiful! 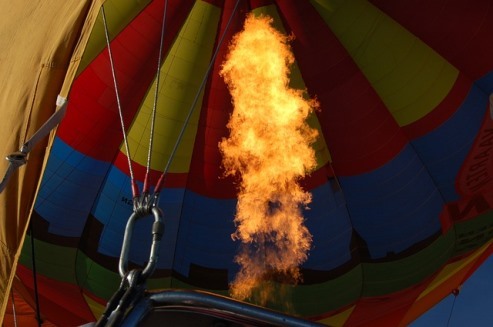 Goodness, ballooning over Napa would be gorgeous! How cool! 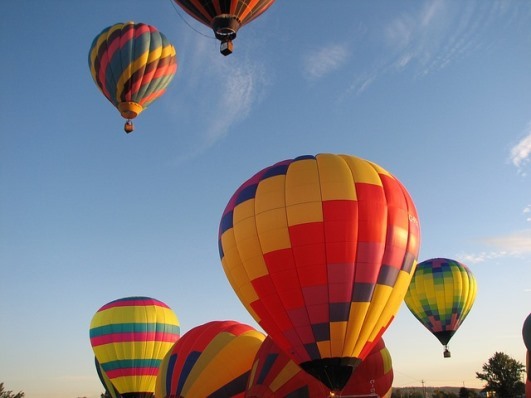 I love those pictures of hot air balloons and I've heard it's a really peaceful and serene way to float through the air. So glad you were rescued from the rodents and I hope your next golden ticket lasts longer! Leanne, I'm hoping for another chance at a longer excursion one day too! Even though the circumstances were a bit unusual, I'm glad I had the experience. Keep fingers crossed for another golden ticket moment! For many years I worked at a group of newspapers and one of my favorite times of the year was the balloon festival. They are so beautiful and yes the ride is incredible. @ out of 6-years there were no rides because of wind and it was so disappointing. When the festival was over they flew over my house. It was amazing. I cannot even imagine seeing all those mice, just one terrorizes me. I am glad you were able to move to firmer ground. You're right the weather conditions have to be perfect to take flight. It can be disappointing if you've waited and then it gets cancelled. Sounds like you had the opportunity to get the inside scoop! Very fun. Doreen, glad you took the time to stop by and read my story. Watching balloon launches is very fun too! Minus the sketchy landing, hope you get the chance to take a ride in one some day. Still hoping to see the Albuquerque event one day. So glad you stopped by Alana.